In my previous article, you saw that a few SAP notes were implemented via SNOTE. In this blog, I will show what happened in the Health Check feature. Health Check, round 2, fight! The yellow traffic lights were not a concern for the time being. I decided to focus on eliminating all remaining red traffic lights. Once I tuned the memory settings and fixed the issues related to the UI5 node in SICF, and clicked on the “Personas Notes Checker” feature: all green! Please also visit the Personas Wiki page. Now, if you want to see what the new SP03 brought to create flavors, then you must look this Productivity Power Play video. Cris, I’m surprised about the em/global_area_MB and remaining memory items in your screen shots. I have never seen them empty like that, and this should not happen. It appears the health check was not able to read those parameters. I’d like to investigate the reason for this. No need for investigation and apologies for give you the wrong impression. I redacted the memory settings, the kernel version and patch level and the SAP_BASIS information. It is just to tell that the blog applies to all supported kernels (7.22, 7.42 and 7.45) and SAP_BASIS (7.0x, 7.31, 7.40 and 7.50). Hi, I wanted to ask how to fix Personas Object editing – Editing of Personas objects transported from other clients or systems is allowed – yellow light? This may be the intended behavior in that client, so not sure if it needs “fixing” – but please see note 2273808 about controlling this function. How to get the compression ON ? 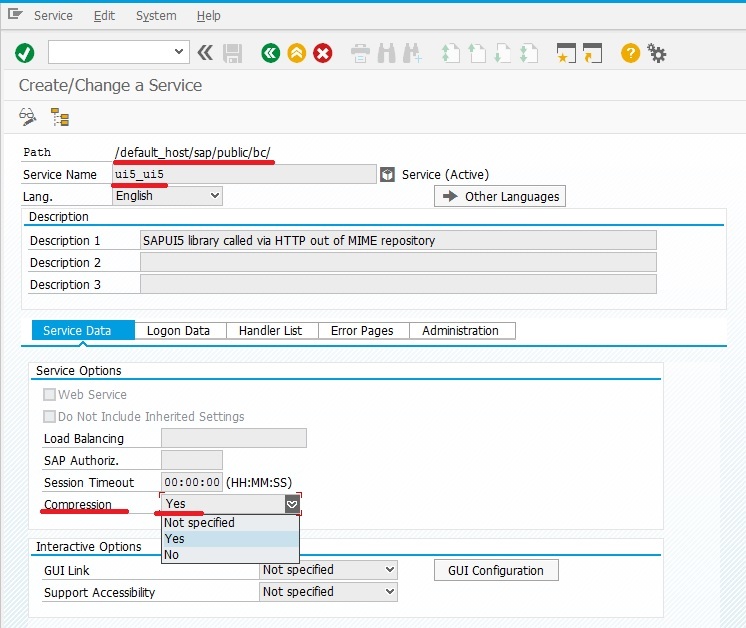 You need to edit the node /default_host/sap/public/bc/ui5_ui5 via SICF. Then set the Compression to “Yes” in the dropdown box. This resolved my Issue – Thank you very much for clear instructions! We on SP04 and we have faced two red mark in System status. We have already applied snotes found by Personas Notes Checker but the errors still be there. How can we get rid of those errors? Can you attach a screenshot from the actual error? Or you can copy/paste the full error. Muito detalhado seu material, parabéns! Pelo SAP Notes Checker, não há nenhuma nota a ser baixada, e não encontro referencia nenhuma sobre essa função… Você tem alguma ideia que possa me ajudar? Nota 0002383295 SAP Screen Personas 3.0 SP04: Required post-installation.